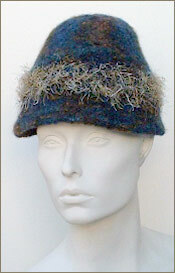 These knitting patterns for felted hats include large, clear photos including photos before they were felted. 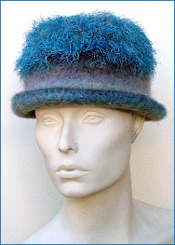 Complete felting instructions are provided. All hats fit the average adult. 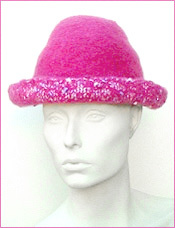 Felting is lots of fun and since you form them to fit your head while wet, you can't go wrong! Order securely with Visa, Mastercard, Discover, American Express or a Pay Pal account and you can be knitting in five minutes with these instantly downloadable patterns. There are no extra shipping or handling charges. After you complete your order, click on "continue". You will then go to the page where you can immediately download your pattern. Just follow the easy instructions on that page. Please order one pattern or collection at a time (place only one order in your shopping cart and then complete your order; come back to the site if you wish to order a second pattern or collection). If you place more than one order in the shopping cart, you will be able to download your first purchase but the remainder will be emailed to you as soon as possible. Purchase the complete collection at the bottom of this page and save! 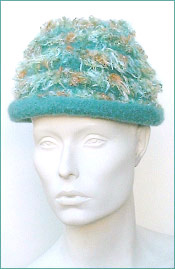 Click on any photo to enlarge and see information on the yarn used. 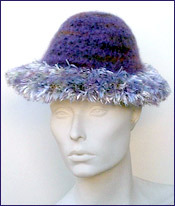 The special price of the Hat Pattern Collection IV is $12.49 U.S., a savings of over $2.00 if purchased separately. This includes all five easy to knit patterns seen here! Click below to order. The patterns are in Adobe Acrobat Reader format. This is a very easy to use program that allows you to navigate between the patterns, charts and photos in each collection. You can print out only the pages you need. Acrobat Reader is absolutely free and if you don't already have it installed, download it by clicking on the picture.